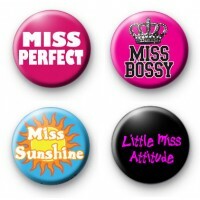 Set of 4 Miss Button Badges consisting of four badges. The first badge is a pink badge with Miss PErfect written in bold white font. The second badge is a bright pink miss bossy badge with a crown design and Miss Bossy written in black text. The third badge is a blue badge with a yellow and orange sun and the words Miss Sunshine written across it in white text. The final badge is a black little miss attitude badge with pink text. These badges are in a pack of four and are ideal to give as a small gift. Handmade in the UK.